Ich Bin Ein One Term Senator! His European Tour, it's like "Bacos", there not real bacon bits they just taste that way! He's President Obama, not President of the United States but all the same great global travel and gesturing as the real thing, with none of the responsibility! I have managed to keep my self on the leash during this endless campaign season, but I can take it no longer! As I have made clear in the past am a free agent. I am not bound to any man or party, and yes that does give me an intellectual and moral sense of superiority in these matters. I have been watching the Obama Preemptive Victory Tour of Europe with increasing nausea. They say that candidates are supposed to look presidential without acting like a president. Well Senator, this must be the first time you have earned a D minus in anything, because you are not pulling it off. But man, how those Germans love a crowded stadium don't they? Whether it is 200,000 cheering a US Presidential hopeful, to politely listening to a 4 and a half hour speech at a Torchlight Bonfire rally for the Fuehrer, or attempting to cheer about their racial superiority to Jesse Owens. Yeah, good times. As one of the leaders of the party that controls both houses of Congress, you would think he might display a hint of guilt surrounding the failure to do thing one about the primary reason his Party was sent to Washington: To put an end to the war in Iraq. No, I guess Change works better on a bumper sticker than it does on the Senate floor. Senator Obama, I hope you realize that there is a serious jump in pay grade from being one of one hundred to the leader of the free world. So, before you take a Victory Lap around the world for an election that is still three months away, you should remember a few things. 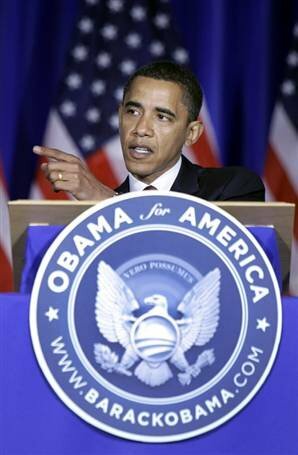 Such as what the olive branch and those arrows in your fake presidential seal represent. The friendship of the United States should not be given idly. Nor should anyone take lightly the meaning of being an enemy of this great nation. But, when your selling something as tangible as Hope and Change, who needs the pesky realities that make up the world.